ahhh, just when you thought i'd forgotten about polka dots! in the same way that i'm aiming to replace my black bowler hat with a straw hat for summer, these denim shorts are hopefully going to become the summertime replacement for my much-worn and loved leather shorts. they're probably a little too short really (i hate my legs!) and so will most likely end up not wearing them with bare legs, but for now they look great with tights. i knew i'd wear this cardigan lots (i think you'll be seeing a lot more of it in the coming months), and apologies for holding this bag in almost all of my posts lately, but i love it. i'm starting to realise lately just how much accessories can complete an outfit. p.s - sorry for the shabby photo quality here, it was so cloudy and dull this day and my boyfriend/chief photographer was getting all huffy and cold, so these were kinda rushed. You look beautiful and you have lovely long legs! I wish I had those! Your shorts are the right size too, don't worry about them! They're a great fit also. Nice touch of the camel with the spots too. Ah! I wish I had your legs! I'd be in everyones face with those legs! You look absolutely gorgeous dear! You look very beautiful. I love the blouse in combination with the cardigan. Love your shorts. You look amazing as always. Haha, although I bet your boyfriend/chief photographer wasn't the one wearing a sheer blouse at the time! Love the combo of the cute polka-dot shirt and that gorgeous cardi! I love that bag, it never gets old! i cant bare to show my disgusting rolls through a see through shirt heheehe! you look lovely like always! I love the tesco cardi! The camel vest, the shoes, the bag... once again - perfection! Love the way you´re wearing this blouse! And I´m jealous of the bag! So wanna have it! And you look great in what you wear always! 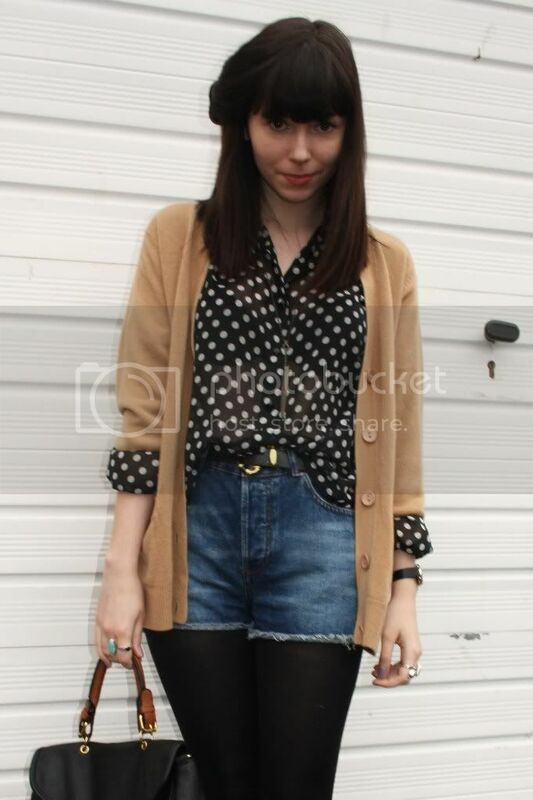 Loveee polka dots, that top is lovely! you have beautiful legs !! and I love that topshop bag.